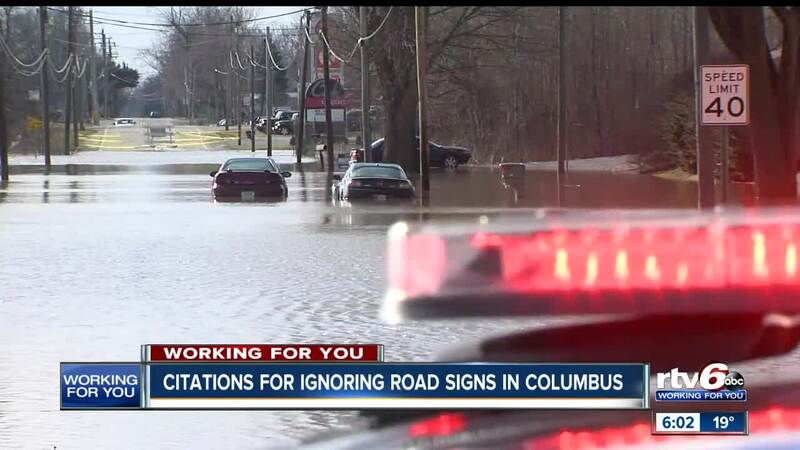 Citations for ignoring road signs in Columbus. COLUMBUS — A steady flow of motorists saw the road closed sign, turned around and went the other way. If only the drivers, in the video above, of these two vehicles had done the same thing. They wouldn't be in this watery, no doubt, costly predicament. Stranded in the overflow waters along State Road 11. By mid-morning, police had already issued half a dozen citations. "We just want people to be safe," Lt. Matt Harris, with Columbus Police Department, said. "We closed this stretch of roadway down when it's not safe for vehicles to pass through. We understand it's gonna take an extra ten minutes, or so, to take a different route to your destination, but the bottom line is we want everyone to arrive safely." The gravity of the decision to charge forward, and ignore the signs was put into words by Vanas Roberts. "You go through the water you got a chance to die, sir," Roberts said. "You get caught in that water and what are you gonna do? You're done." RTV6 talked to a tow truck driver who had a very busy night because of drivers who ignore road closed signs. "When I have to pick you out of the water, it puts me in danger," Charles Denton, a tow truck driver, said. "It puts you in danger, it endangers everyone involved. Ignoring high water signs is not a very smart thing to do. I don't see anything wrong giving citations for it." The signs are up and the water is still rising. Columbus police put its decision to issue citations on it's Facebook page. Officers are stationed at many of those road closed sites. Don't ignore the signs. Just don't.